A new Spanish study published in The Journal of Urology finds that men who closely followed a Mediterranean style diet (including fish, boiled potatoes, whole fruits, vegetables, legumes, olive oil, and minimal juices) had significantly lower risk for aggressive PCa (Gleason score above 6 or clinical stage T2b to T4 disease) than men adhering to a “prudent” diet or Western diets. In the MCC-Spain (Multicase-Control Study on Common Tumors in Spain) case-control study, researchers compared the diets of 733 patients with histologically-confirmed PCa and 1229 healthy men (mean age 66 years) from 7 provinces in Spain. After completing a 154-item food frequency questionnaire, men's dietary intake and habits were graded according to how closely they matched the 3 dietary patterns. Western diets commonly contain high-fat dairy products, refined grains, processed meat, high-calorie drinks, sweets, convenience foods and sauces, and a low intake of low-fat dairy products and whole grains. A prudent diet centers on low fat dairy products, whole grains, vegetables, fruits, and juices. 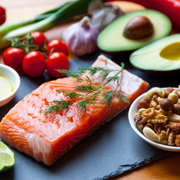 High adherers to a Mediterranean-style diet had a significant mean 33% lower risk for PCa above Gleason score 6 and a 51% lower risk for clinical stage T2b to T4 disease. The other dietary patterns showed little or no significant associations with aggressive disease. "Our results show that a diet oriented towards the prevention of aggressive tumors in the prostate should probably include important elements of the Mediterranean diet such as fish, legumes, and olive oil, and suggest that a high intake of fruits, vegetables, and whole grains might not be enough," explained lead investigator Beatriz Perez-Gomez, PhD, of the Cancer and Environmental Epidemiology Unit at the Instituto de Salud Carlos III in Madrid, according to a news release from the American Urological Association, which publishes The Journal of Urology. A more complete Mediterranean diet may protect against aggressive prostate cancer [news release]. Elsevier, Jan 10, 2018. Article written and published by: Persaud, Natasha. "Mediterranean Diet Best for Lowering Aggressive Prostate Cancer Risk." Renal & Urology News, 12, Jan. 2018 www.renalandurologynews.com/prostate-cancer/prostate-cancer-risk-mediterranean-diet-best-against-aggressive-disease/article/736650/.